Linear generation is a relatively crude way of turning a colour image into a monochrome working image, and while Range generation is an effective alternative for monochrome datasets (e.g. from CT scanning), both approaches potentially misses subtleties of colouration in colour-based datasets (e.g. from serial grinding), where different materials can be picked out with colour differences rather than simply brightness level. Polynomial generation mode is a more sophisticated approach to this generation-from-colour problem, which can in some circumstances produce ‘better’ thresholds, which will need less manual editing afterwards. It is however more complex both in concept and practice, and it recommended only for advanced users. Polynomial generation uses the concept of training; the user first manually edits a region of the dataset to their satisfaction, so that all pixels in this region (which can span multiple slices) are assigned to their correct segments. SPIERSedit is then asked to create generation rules (based on mathematical polynomial equations) which would work replicate this manual editing work as effectively as possible (i.e. would correctly predict the segment assignment in the sample for as high a percentage of pixels as possible). Once created, these rules can be applied using the Generate button to all selected slices (or with the Recalc brush) in the same way as for Linear generation. where v is the greyscale value, r, g, and b are the red, green and blue values of the colour image, and n (the order of the polynomial) and k1 to k(3n+3) (constants) are the values that comprise the rule. 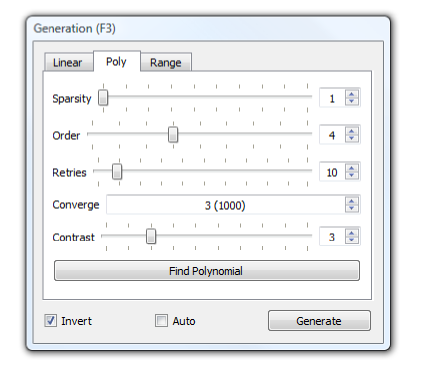 The Poly tab of the Generation Panel provides controls for the creation of polynomial rules; with this tab selected, the Generation button (and the Recalc brush) will use polynomial mode generation rules. Polynomial mode can be used for multi-segment datasets, but both Polynomial rule-creation and generation is performed on a per-segment basis. SPIERSedit uses a genetic algorithm to create polynomial rules; this approach simulates Darwinian evolution to ‘breed’ effective rules. It starts with a random rule (or the best rule from the last time the genetic algorithm was run, if applicable) and determines what percentage of the pixels in the supplied sample would have come out correctly had that rule been used. It then makes a small random change to the rule, and checks again. If the new rule performs better (is ‘fitter’) it is retained, otherwise it is discarded. The process is repeated for many ‘generations’ until the rule reaches an optimal fitness and no further improvements appear to be possible. Polynomial generation requires a sample of edited ‘correct’ pixels to build its rules. The sample used is the pixels turned ‘blue’ in Lock/Selection mode (see below) for all slices selected in the Slice Selection panel; it can thus consist of as many or as few pixels on as many slices as the user desires. SPIERSedit has no facility for storing samples; whenever ‘Find Polynomial’ is clicked the current selection is used, and any previous sample is discarded. The Poly tab on the Generation panel (see Fig. 14) provides controls for the polynomial rule creation process. Figure 14. Poly tab of the Generation Panel. Sparsity: Controls how many of the sample pixels are used in the breeding process. A sparsity of 1 means every pixel is used, 2 means every other pixel, 5 every fifth pixel etc. Use this to speed the breeding process, although this might result in slightly less fit rules. Order: Strictly speaking this is not part of the breeding process, but like the other settings it should be set before breeding. It controls the ‘order’ of the polynomial (n in the mathematical note above). Normally you can leave this at the default value of 4. Increasing it increases the time take to breed a solution, but can (in theory at least) result in better rules. Changing this and then generating without first creating breeding new rules with ‘Find Polynomial’ can result in strange behaviour! Retries: The number of times the breeding process is run. Genetic algorithms can become stuck in blind alleys, where the rule has stopped improving, but is still far worse than it could be because a wrong direction was taken early on. To get around this the breeding process is run several times with different starting rules each time; the best solution from all runs is then taken. The catch is that the time taken for the genetic algorithm to run in proportional to the number of retries used. You should normally use at least five retries, unless you are refining an existing rule (see below). The default is 10. Converge: The number of generations without any improvement before the algorithm gives up trying to make a rule better. High values make for slower breeding but (potentially at least) slightly better rules. Contrast: This isn’t a setting for breeding but for generation. You may find that a rule generates greyscale images with either too little contrast (where most pixels are either just brighter or just darker than the threshold level), or too much contrast (where most pixels are either pure black or pure white). This doesn’t affect the threshold image, but does affect the usefulness of the brightness brush – you need a reasonable amount of contrast to play with. Changing the contrast setting to compensate for this – check how much contrast you have by generating and visually inspecting the working image by turning off thresholding (untick Threshold on the Mode menu). Find Polynomial button: Starts breeding with the current settings. Progress is reported in a small dialog, which reports the fitness of the current (‘Best’) rule as a percentage, representing the proportion of pixels in the sample that the current rule predicted correctly (so high is good); values of over 95% are normally attainable. The algorithm can be left to run to completion, or can be stopped at any time with the stop button. Whether the operation is complete or has been manually stopped the best rule found will be used. Once completed or stopped, the dialog should be closed with it’s ‘Close’ button. Breeding can take a long while, particularly for large samples across multiple images. The best way to speed it up is to perform a two-stage breed. Firstly, set a large number of retries (say 30 or so), but choose a low convergence (say 2000) and a high sparsity (how high depends on the speed of the computer and the size of the sample – anything that makes things go reasonably quickly). Perform a Find Polynomial operation with these settings, which will try a lot of different rules in a rough-and-ready way. From this you will end up with one good candidate. Now set up a careful breed without any retries (set retries to 1, sparsity to 1, and converge to 32000 or more) and perform a second Find Polynomial operation. This second run of the algorithm will take the best rule from the first run and give it as much chance to improve as possible. Using this two-stage approach, high quality rules can normally be generated in a few minutes at most.